Dr. Todd Voss (pictured in foreground), president of Southern Wesleyan University, leads the Presidents’ Panel Discussion during the October 12 Board meeting. 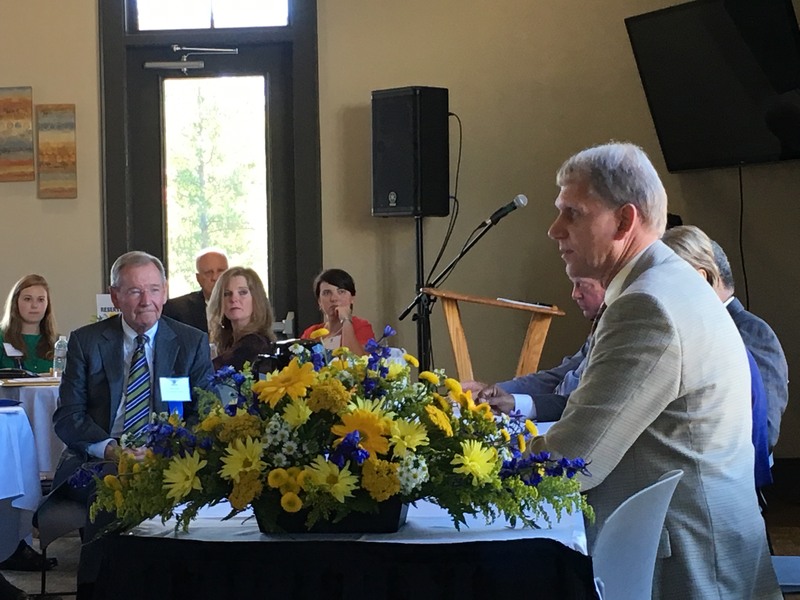 COLUMBIA, SC — During the October 12 Board meeting awards luncheon, presidents of four of SCICU’s member college and universities fielded questions from the board’s at-large trustees. Topics of the lively discussion included regulations impacting higher education, growth of online programs, impact of campaign promises for free public higher education, and college evaluation/ selection by Generation Z.
Dr. Todd Voss, president of Southern Wesleyan University, moderated the panel discussion. Other SCICU member presidents participating in the panel included Beth Dinndorf, President of Columbia College; Dr. David Swinton, President of Benedict College; and Dr. Maurice Scherrens, President of Newberry College.